Honor the Mothers in Your Life & Support Afghan Women Writers! AWWP writers share with us many powerful stories of the mothers in their lives. This Mother’s Day, we will honor Afghan mothers by publishing new essays and poems written in their honor. 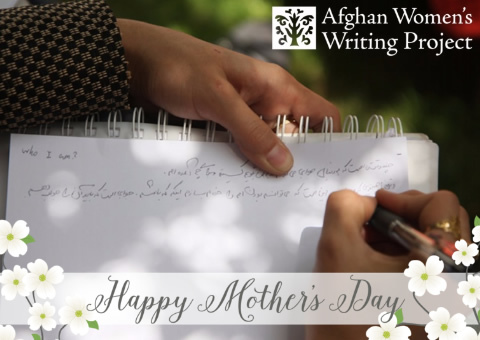 You can honor the mothers in your life and help us support Afghan women writers with a special Mother’s Day donation. Give now and you and your honoree will be listed on our website Honor Roll. Give $50 or above and we will mail your honoree a special card. Give $100 or more we will include an AWWP tote-bag (for you or the honoree). Next week, we will publish a new collection of poems and essays for Mother’s Day 2016. You will be moved by these pieces, and we encourage you to read, comment, and share them with those you love. As always, thank you for your support of the Afghan Women’s Writing Project! The development of women In a country shows how advanced is that country. Humanity is made of men and women, progress in one side permits progress in the other side.